The meaning of V, GV and GTX in the Asolo style names: V stands for a Vibram outsole, GV stands for Gore-Tex lining with a Vibram outsole, and GTX is for a GORE-TEX lining. 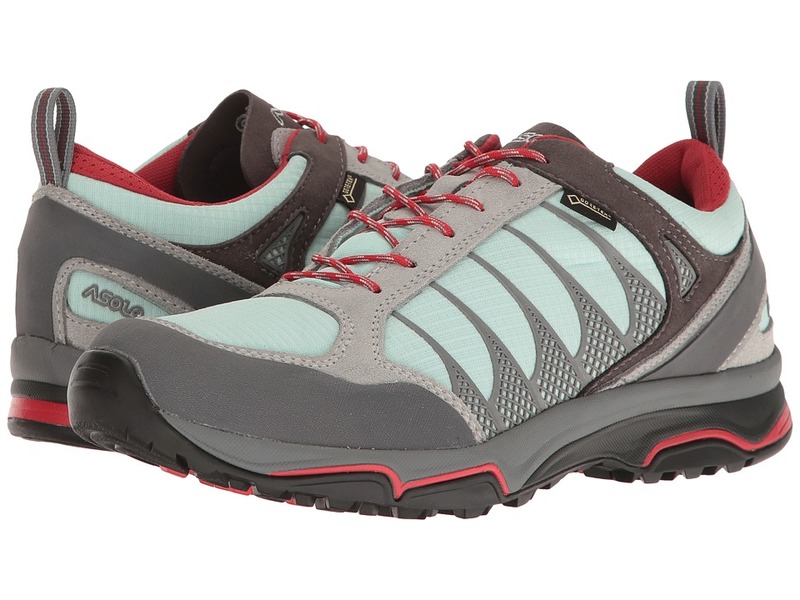 Be bold on every trail with the superior protection and outstanding comfort of the Megaton GV hiking shoe from Asolo! Ideal for light hiking from summer into winter. Hardy, 1.6-1.8mm, water-resistant suede leather upper and features breathable polyester side panels. GORE-TEX Extended Comfort Footwear technology offers waterproof protection to ensure feet stay dry and comfortably cool. This non-insulated safeguard is best suited for moderate to warm climates. Plush tongue and collar for added comfort and performance. Heel pull loop for easier on and off. Durable rubber toe cap for added protection. Lite 2 plus insole offers lightweight support and superior underfoot comfort. Molded EVA midsole provides long-lasting cushion for all-day comfort. Asolo/Vibram Mega Grip is a highly technical outsole, where the balance of the sole has self-cleaning lugs designed for optimum performance on varying types of terrain. Made in Romania. Measurements: Weight: 15 oz Product measurements were taken using size US Men~s 11.5, width D - Medium. Please note that measurements may vary by size. Weight of footwear is based on a single item, not a pair. The meaning of V, GV and GTX in the Asolo style names: V stands for a Vibram outsole, GV stands for Gore-Tex lining with a Vibram outsole, and GTX is for a GORE-TEX lining. 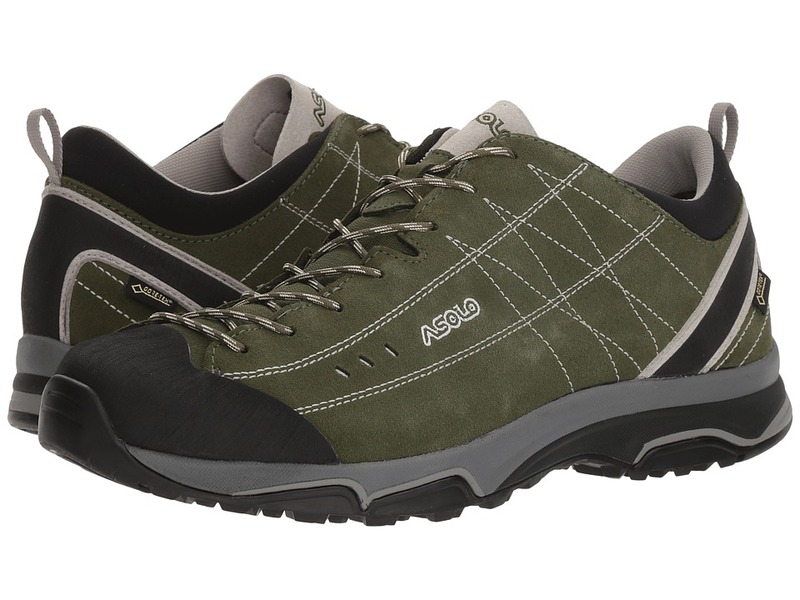 The Nucleon GV boot by Asolo keeps you supported and comfortable while you hit the trails. Ideal for light hiking and summer thru winter walking. 1.6-1.8mm water-resistant suede and Schoeller soft shell upper. Classic lace-up closure. Gore-Tex Extended Comfort lining is waterproof and breathable for a drier, more comfortable foot environment. Lite 2 insole offers lightweight support and underfoot comfort. Supportive single density EVA midsole. Rubber toe cap. Asolo/Vibram Megagrip highly technical sole. Outsole has self-cleaning lugs designed for optimum performance on varying types of terrain. Imported. Measurements: Weight: 14 oz Product measurements were taken using size US Men~s 11.5, width D - Medium. Please note that measurements may vary by size. Weight of footwear is based on a single item, not a pair. The meaning of V, GV and GTX in the Asolo style names: V stands for a Vibram outsole, GV stands for Gore-Tex lining with a Vibram outsole, and GTX is for a GORE-TEX lining. 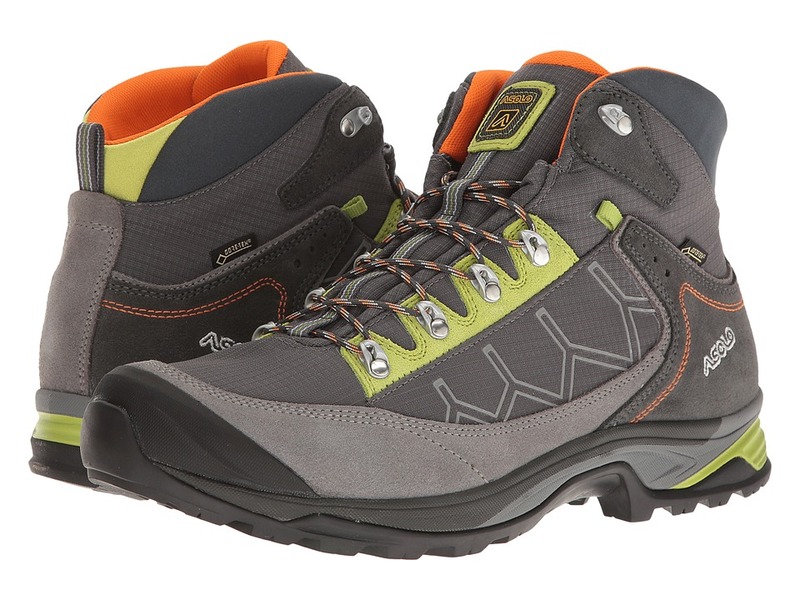 The Asolo Falcon GV hiking boot ensures a smooth ride on any terrain. 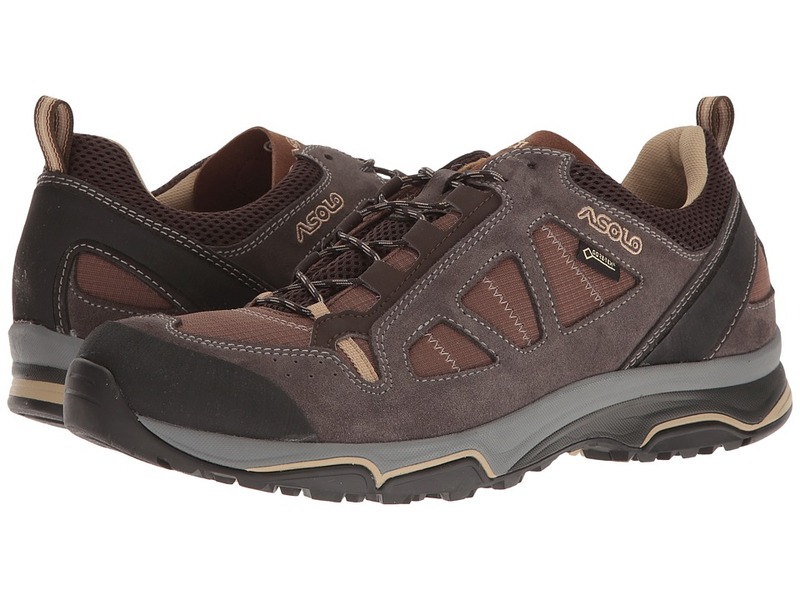 Features the Radiant sole, specifically designed for trekking enthusiasts. Mid-cut design provides superior ankle protection. Hardy, 1.6-1.8mm, water-resistant suede leather upper offers exceptional durability. High tenacity nylon panels are abrasion resistant and help maintain a breathable environment. GORE-TEX Extended Comfort Footwear technology offers waterproof protection to ensure feet stay dry and comfortably cool. This non-insulated safeguard is best suited for moderate to warm climates. Plush tongue and collar for added comfort and performance. Heel pull loop for easier on and off. TPU toe cap offers added protection on the trail. Lite 2 plus insole offers lightweight support and superior underfoot comfort. Molded EVA midsole provides long-lasting cushion for all-day comfort. Radiant, Asolo-Vibram, rubber outsole with aggressive heel cleats and Asolo brake system for exceptional grip and protection over varied terrain, as well as enhanced pronation control. Built on the Asoloflex 00 SR last. Made in Romania. Measurements: Weight: 1 lb 4 oz Product measurements were taken using size US Men~s 11.5, width D - Medium. Please note that measurements may vary by size. Weight of footwear is based on a single item, not a pair. The meaning of V, GV and GTX in the Asolo style names: V stands for a Vibram outsole, GV stands for Gore-Tex lining with a Vibram outsole, and GTX is for a GORE-TEX lining. The superior protection, outstanding comfort, and awesome grippy outsole of the Fulton hiking boot from Asolo lets you conquer the trails! Ideal for light hiking from summer into winter. Hardy, 1.6-1.8mm, water-resistant suede leather upper and features breathable polyester side panels. Velveteen lining provides excellent comfort and breathability. Plush tongue and collar for added comfort and performance. Heel pull loop for easier on and off. Durable rubber toe cap for added protection. Lite 2 plus insole offers lightweight support and superior underfoot comfort. Dual density EVA midsole provides long-lasting cushion for all-day comfort. Asolo/Vibram Mega Grip is a highly technical outsole, where the balance of the sole has self-cleaning lugs designed for optimum performance on varying types of terrain. Made in Romania. Measurements: Weight: 1 lb 3 oz Product measurements were taken using size US Men~s 12, width D - Medium. Please note that measurements may vary by size. Weight of footwear is based on a single item, not a pair. The meaning of V, GV and GTX in the Asolo style names: V stands for a Vibram outsole, GV stands for Gore-Tex lining with a Vibram outsole, and GTX is for a GORE-TEX lining. The waterproof protection, durable construction, and reliable outsole of the Thyrus GV boot from Asolo keeps you steady on your feet and bold in your adventures! Ideal for hiking from summer into winter. Mid-cut design provides superior ankle protection. Hardy, 1.6-1.8mm, water-resistant Perwanger leather upper and features a Schoeller soft shell. GORE-TEX Extended Comfort Footwear technology offers waterproof protection to ensure feet stay dry and comfortably cool. This non-insulated safeguard is best suited for moderate to warm climates. Plush tongue and collar for added comfort and performance. Heel pull loop for easier on and off. Durable rubber toe cap for added protection. Lite 2 plus insole offers lightweight support and superior underfoot comfort. Molded EVA midsole provides long-lasting cushion for all-day comfort. Redster Asolo/Vibram Mega Grip is a highly technical outsole, where the balance of the sole has self-cleaning lugs designed for optimum performance on varying types of terrain. Built on the Asoloflex 00 SR last. Made in Romania. Measurements: Weight: 1 lb 1 oz Shaft: 5 in Product measurements were taken using size US Women~s 8.5, width B - Medium. Please note that measurements may vary by size. Weight of footwear is based on a single item, not a pair. The meaning of V, GV and GTX in the Asolo style names: V stands for a Vibram outsole, GV stands for Gore-Tex lining with a Vibram outsole, and GTX is for a GORE-TEX lining. 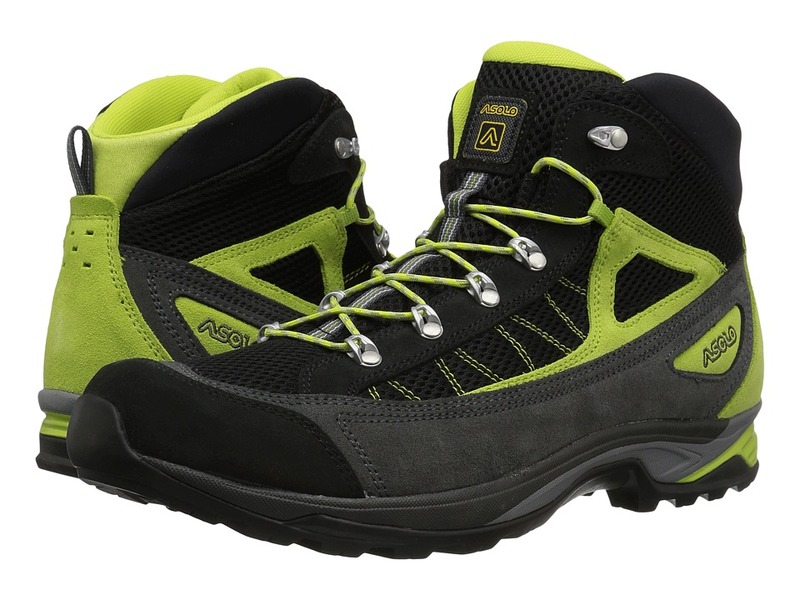 Warm-weather hikes are ahead, so stay on track with the Blade GV boot by Asolo. Water-resistant suede and polyester upper. Lace-up closure. Gore-Tex lining is waterproof and breathable. Lite 2 insole offers lightweight support. Supportive EVA midsole. Rubber toe cap. Asolo/Vibram Megagrip highly technical sole. Outsole has self-cleaning lugs designed for optimum performance on varying types of terrain. Imported. Measurements: Weight: 10 oz Product measurements were taken using size US Women~s 6.5, width B - Medium. Please note that measurements may vary by size. Weight of footwear is based on a single item, not a pair. The meaning of V, GV and GTX in the Asolo style names: V stands for a Vibram outsole, GV stands for Gore-Tex lining with a Vibram outsole, and GTX is for a GORE-TEX lining. 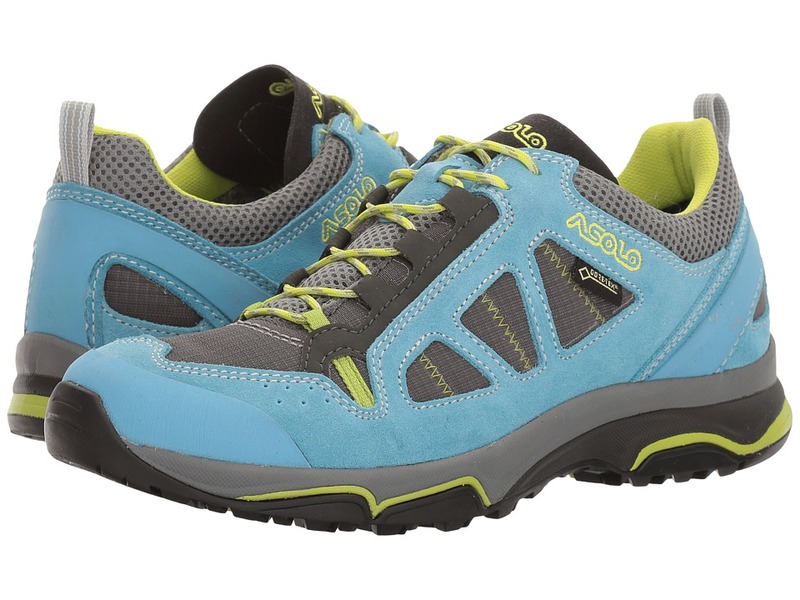 Be bold on every trail with the superior protection and outstanding comfort of the Megaton GV hiking shoe from Asolo! Ideal for light hiking from summer into winter. Hardy, 1.6-1.8mm, water-resistant suede leather upper and features breathable polyester side panels. GORE-TEX Extended Comfort Footwear technology offers waterproof protection to ensure feet stay dry and comfortably cool. This non-insulated safeguard is best suited for moderate to warm climates. Plush tongue and collar for added comfort and performance. Heel pull loop for easier on and off. Durable rubber toe cap for added protection. Lite 2 plus insole offers lightweight support and superior underfoot comfort. Molded EVA midsole provides long-lasting cushion for all-day comfort. Asolo/Vibram Mega Grip is a highly technical outsole, where the balance of the sole has self-cleaning lugs designed for optimum performance on varying types of terrain. Made in Romania. Measurements: Weight: 12 oz Product measurements were taken using size US Women~s 8, width B - Medium. Please note that measurements may vary by size. Weight of footwear is based on a single item, not a pair. The meaning of V, GV and GTX in the Asolo style names: V stands for a Vibram outsole, GV stands for Gore-Tex lining with a Vibram outsole, and GTX is for a GORE-TEX lining. 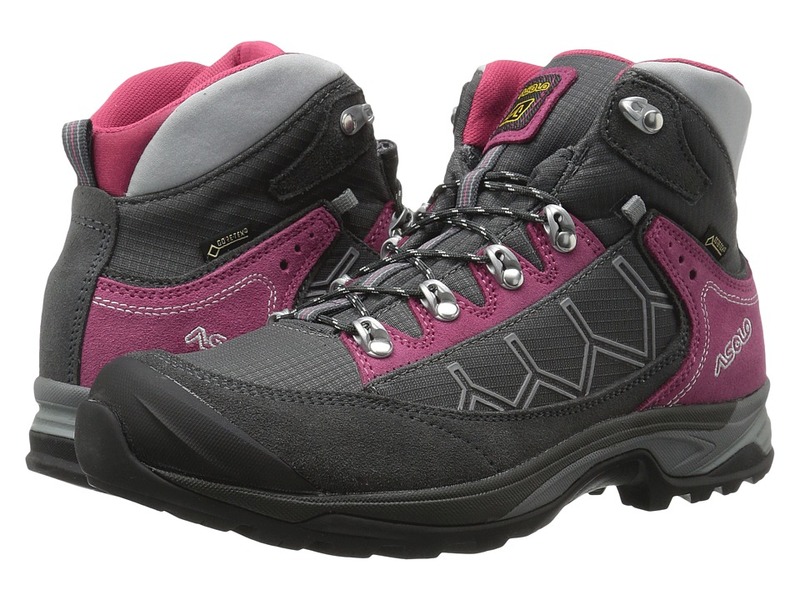 Keep on trekkin~ with the durably stylish Nucleon GV boot by Asolo. Ideal for light hiking and summer thru winter walking. 1.6-1.8mm water-resistant suede and Schoeller soft shell upper. Classic lace-up closure. Gore-Tex Extended Comfort lining is waterproof and breathable for a drier, more comfortable foot environment. Lite 2 insole offers lightweight support and underfoot comfort. Supportive single density EVA midsole. Rubber toe cap. Asolo/Vibram Megagrip highly technical sole. Outsole has self-cleaning lugs designed for optimum performance on varying types of terrain. Imported. Measurements: Weight: 12 oz Product measurements were taken using size US Women~s 8.5, width B - Medium. Please note that measurements may vary by size. Weight of footwear is based on a single item, not a pair. The meaning of V, GV and GTX in the Asolo style names: V stands for a Vibram outsole, GV stands for Gore-Tex lining with a Vibram outsole, and GTX is for a GORE-TEX lining. 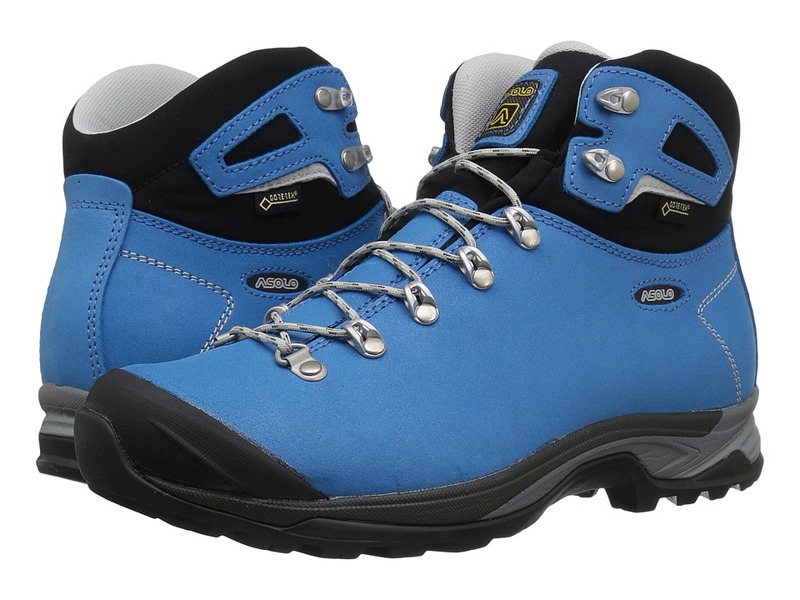 The Asolo Falcon GV hiking boot ensures a smooth ride on any terrain. Features the Radiant sole, specifically designed for trekking enthusiasts. Mid-cut design provides superior ankle protection. Hardy, 1.6-1.8mm, water-resistant suede leather upper offers exceptional durability. High tenacity nylon panels are abrasion resistant and help maintain a breathable environment. GORE-TEX Extended Comfort Footwear technology offers waterproof protection to ensure feet stay dry and comfortably cool. This non-insulated safeguard is best suited for moderate to warm climates. Plush tongue and collar for added comfort and performance. Heel pull loop for easier on and off. TPU toe cap offers added protection on the trail. Lite 2 plus insole offers lightweight support and superior underfoot comfort. Molded EVA midsole provides long-lasting cushion for all-day comfort. 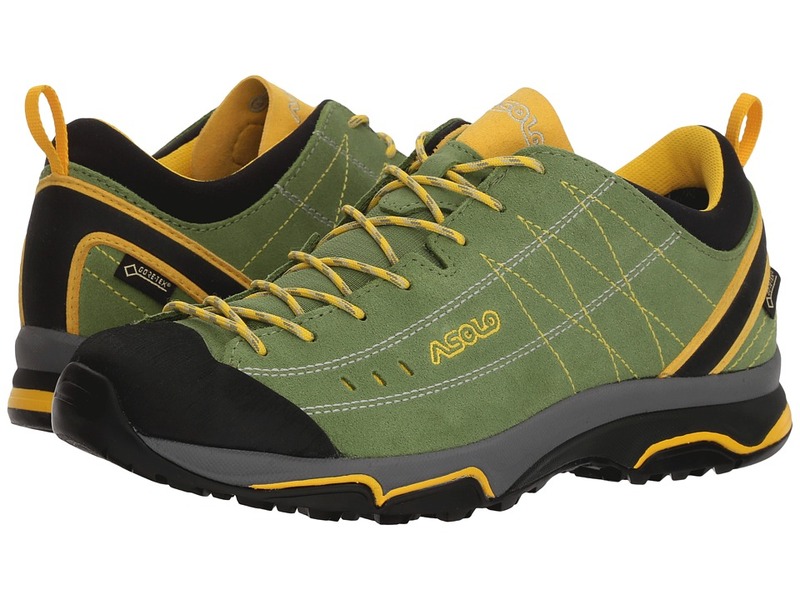 Radiant, Asolo-Vibram, rubber outsole with aggressive heel cleats and Asolo brake system for exceptional grip and protection over varied terrain, as well as enhanced pronation control. Built on the Asoloflex 00 SR last. Made in Romania. Measurements: Weight: 1 lb Shaft: 4 1 2 in Product measurements were taken using size US Women~s 7.5, width B - Medium. Please note that measurements may vary by size. Weight of footwear is based on a single item, not a pair.